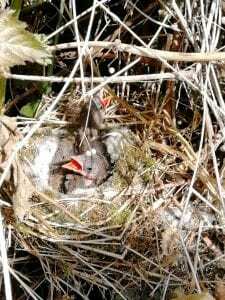 We were very excited to discover that our wildlife area is obviously doing its job, with not one but two birds’ nests found last week. We have found a nest in one of the trees, and another in the shrubs underneath. The nest in the tree still has eggs, but the one on the ground is already hosting some very small fledglings. We have talked to the children about both nests, and let them know that this lovely area of the school is out of bounds until all of the eggs have hatched and the chicks have fledged. What a lovely welcome to the week!